Sounds pretty good for the Trump administration, right? 66% of voters having a positive opinion of anything that's related to the president would be worth tweeting, I agree. But the problem is, this seems to be a cherry-picked outcome from the poll that is otherwise mostly unfavorable in a variety of ways about Sanders' boss. Let's take a look at the headline of the press release for the poll. Wow - genius, maybe - but it sure doesn't sound like stable genius, does it? Before we dive in, let's do the fine print: the survey was taken the 5th - 9th, with 1,106 voters surveyed via land lines and cell phone. The margin of error is +/- 3.6 percentage points. Good? Trump's approval rating is only 36%, down a point from the last poll; across all demographics except Republicans - political affiliation, age, gender, race - more disapprove than approve. The same is true with the level of disapproval; 'strongly disapprove' leads in every demographic except Republicans, where strongly approve, naturally, is the winner. Again across all demographics except the Republicans, people say Trump did about as was expected in his first year. And, with the exception of white men, "worse than expected" had a higher percentage than "better than expected." Republicans think he did better than and white men think he did better than expected. And, when it comes to optimism or the lack thereof for the next few years of Trump presidency, Republicans (87%), whites without college degrees (58%) and white men (51%) were the only optimistic groups. Folks 65 and older, and whites each were 49% optimistic and 49% pessimistic. All other groups? Pessimistic. While Sanders grabbed hold of the positive vote for the economy, there's not a lot in the poll that credits Trump for what's going on. Most voters (except Republicans), think Trump's policies aren't making a difference in their personal finances; this is consistent regardless of race, age, income level, and class (working, middle, upper middle+). Results are fairly mixed on whether Trump's policies are helping the economy. In total, 37% say helping, 29% say hurting, and 30% say no difference. 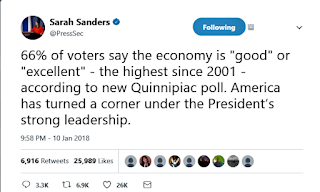 Women (34%) 18-34 year olds (35%), blacks (44%) and Hispanics (43%) and folks with household income of $30K -$50K (35%) say his policies are hurting the economy. Most demographic populations credit President Obama not president Trump for the economy; Republicans (70%), those 65 and older (47%), and whites without college degrees (46%) credit Trump. Moving on to the questions touching on what people think about Trump. Only Republicans think Trump shares their values (76% yes, 22% no). The only demographic that's even close? You guessed it - whites without college degrees (46% yes, 51% no). Overall, 65% say no. Everyone, other than Democrats, (32%) think Trump is a strong person; 59% of all respondents say he is. On the flip side, 69% of votes say he's not level headed, with only the Republicans (a remarkable 65%) say he is. More folks say he's intelligent than not (53% - 44%). Non college educated whites (67%), men generally (56%) and white men specifically (61%) agree by the largest percentage. Most think he doesn't care about average Americans (59% no, 38% yes), with Dems and blacks disagreeing the most (93% and 88%, respectively); that he doesn't have good leadership skills (59% yes, 39% no); and that he's not honest (63% no, 34% yes). What grade did he earn for his first year? Across all demographics, he earned an F more frequently than any other grade, other than GOP voters, 91% of whom gave him a C or better. I want what they're smoking. And, on "what one word would you use to describe the president's first year in office?" - a question where people could say whatever they wanted, over 40 terms were mentioned at least five times. Positive terms and the number of times mentioned included: successful (42); great (27); good (26); awesome (21), excellent (20), and outstanding (15). Neutral terms? Interesting (23 mentions), different (10) and surprising (10). Negative words included disaster (69), chaotic (62), horrible (28), embarrassing (24), terrible (24), and disappointing (19). Finally, speaking of embarrassing, by a difference of 40 percentage points (66% to 26%), voters think Trump has damaged our reputation around the world, rather than helped repair it. Only -- yes, Republicans - think that he's helping (64%) more than he's hurting (25%). So -- while Trump, House Republicans in particular but Senate Republicans, too seem to think that the stock market doing well is what "America" means, the rest of the population thinks there's more to it than that.